Most crafty people know me through my etsy shop, which focuses on a variety of new bindings includings miniature books, journals, and photo albums. Making these things is great fun, but it's only part of what I do! I also do custom work, and repairs. Why have a book repaired? Some books are irreplaceable due to thier rarity or sentinmental value. 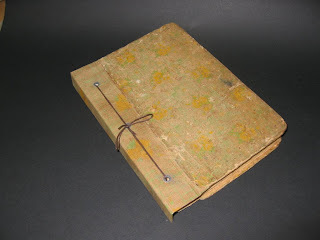 Most books deteriorate though age and heavy use, and need some sort of repair if its owner wishes to keep using it. A client brought in an old cookbook which had belonged to his grandmother. He had many fond memories of seeing this cookbook in his grandmother kitchen, and wanted to restore it's appearance and usability. When I received the book, the pages were falling out, and the spine and a piece of the back cover were missing entirely, as were the first few pages of the book. I took the whole thing apart, mended the paper as needed, re-sewed the book, and re-created the pieces of the cover that had gone missing. I even painted cloth to match the original. After many hours of work, the book can now be used or displayed for years to come! That is amazing! What a wonderful skill. 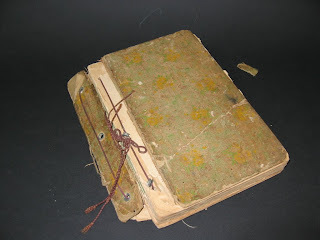 Have you ever worked on restoring books for libraries or museums? Yes, and I'd like to so that full time once I complete my training! I have done this kind of work for libraries before, and I hope to do so full time when I complete my training.